It finally ended. After fifteen years, and overstaying its welcome by at least eight, one of the pillars of anime and manga of the last few decades has come to an end. Shounen Jump has lost one of its more recognisable figureheads, and I no longer feel compelled to complain every week about a new chapter of rushed plotting or emotion-free battles between giant blob-creatures. As I mentioned in my review of the pre-timeskip anime series, Naruto is deeply unfashionable. But I will defend it to the ground. Of its fifteen years, I’ve been following it for twelve-ish. Twelve years of my life with these characters, at least once a week, and most times two. That’s pretty remarkable. A large chunk of the crowd at any anime crowd will have been learning to spell ‘cat’ when I started to read Naruto. So my perspective is a little different from the average, I guess. That, I think, is why I’m keen to defend it. Or at least, what it was. Post-timeskip, Naruto was largely an emotionally flat, highly contrived, rather ugly series of battles between uninteresting men with an inflated sense of self-importance. But it wasn’t like that to begin with. Which is why, once again, I think that in a few years’ time it will be rehabilitated and remembered fondly – just as happened with Dragonball. When I first joined the anime fandom, Dragonball was hated for GT and the prolonged screaming matches of Dragonball Z. Now it’s largely adored, primarily on the strength of the first series and the early parts of Dragonball Z. I expect the same will happen with Naruto when its best parts come into focus again. Because I maintain that early Naruto was genuinely good. It was about ninja kids who were weak but ingenious, and who had people ready to push them, challenge them and if need be, protect them. Back then, it was largely a school drama. Naruto himself was an intentionally annoying brat, while Sasuke was uppity and smug. Yet both were likeable and oddly cute. What made Naruto huge was the quick succession of two story arcs that blended cuteness and silliness with genuine emotionally heavy-hitting moments: first, the battle against Zabuza and Haku, which brilliantly had the enemies be sympathetic thanks to their deep bond and also immediately pitted the kids against someone genuinely dangerous. Naruto had a lot to prove and did it well – even if it had to rely on the cheesy ‘he didn’t really die!’ moment. Kishimoto proved this wasn’t just a one-off by following up with the chuunin exam arc – first, with the compelling character of Gaara, who was tortured, antisocial and merciless. The idea that this was a world of incredibly powerful warriors was cemented, and Orochimaru was a genuine threat in the background. While there was a certain laziness to then going into a tournament arc, as so many series do, Kishimoto did these battles better than most, with almost all of the fights between low-level opponents being won thanks to some genuinely clever little trick. Itachi was an enigma, part of an organization that seemed genuinely threatening and cool (back then), and the summons of the sannin seemed like absurdly powerful, more or less exclusive talents. It all fell apart around then. Big summons led to bigger and bigger ones, and then the use of tailed beast powers, ending up with dull fights between big blobs. There was a time skip and the characters were no longer underdogs. The tricks were no longer clever because the stakes had to constantly be upped. Naruto couldn’t get away with being annoying because he was adorable any more, and Sasuke just became annoying. Akatsuki were revealed to be largely ridiculous and could mostly be defeated by being made to realize their evil actions were – gasp! – evil. Itachi was given redemption, but not before being made to look completely ridiculous in what should have been a series highlight. The final battle with a very old man and some almost random summoned goddess woman was entirely without tension and the last clash of all, prefigured for fifteen years, was rushed into very unconvincingly, over very quickly and entirely without emotional weight. Like so many shounen titles – particulary Dragonball and Reborn – as well as a fair number of Western kids’ stories (like Harry Potter), the big problem with Naruto is that it started fun, jokey and cute, then tried to take itself too seriously. It lost the balance and became largely tedious, and unable to have much emotional impact. Thus, which the classic ‘see-them-as-adults-with-their-kids’ ending of Digimon and yes, Harry Potter had some small smiles in it, mostly for minor characters, I can’t say I’m sad to see this era come to a close. But I remember that Naruto was once great, and that’s the main thing I’ll always take from it. I very much agree with you! 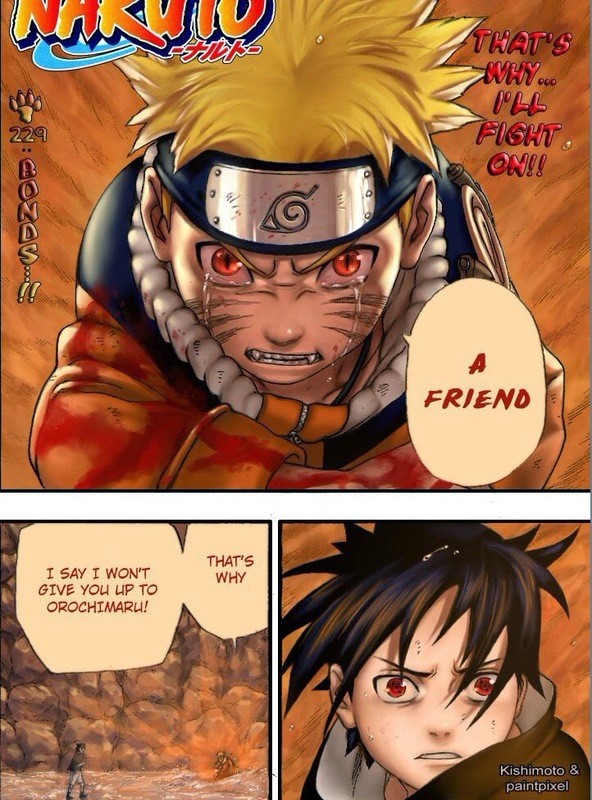 I was not on Naruto for a lot of time but it's still sad to see it go.